In this episode Luke and Pedro bring light to the top stories from the past weekend of North American soccer action. Conversations of MLS results, attitudes and new stadiums continue. 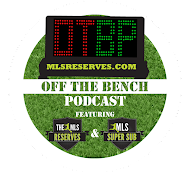 Casey Townsend of DC United joins the show to talk about his on-loan efforts for USLPRO side Richmond Kickers and Dennis Chin of Orlando City SC joins to discuss his plans for this season as well. Get Off The Bench. Thanks for listening guys. Here's your reward.